Our team at Frank’s Steaks is what really makes us different from all of the other Long Island Steakhouses. Owned by Richard Gerzof and Nicholas Drossos since 1993, Frank’s is known for high-quality prime meats and an extensive menu unlike any other steakhouse. Our most popular items are our Marinated Romanian Skirt Steak (called the “Best Skirt Steak on Earth” by Zagat), Garlic Rib Eye Steak, Cajun Calamari with Roumalade sauce and Honey Pecan Roasted Chicken. We are known for our large portions, casual atmosphere and great value for your money. Although Rockville Centre’s Frank’s Steaks opened in 2002, it quickly became one of the premier steakhouses on Long Island. Over the past three years, Newsday has honored Frank’s Steaks by naming us one of the top ten steakhouses on Long Island. We have been Zagat-rated since 1988. To fully understand how Frank’s operates, you first must get to know our team of hard-working principals and partners. Nicholas Drossos was born in 1957 and graduated from Half Hollow Hills High School in 1975. He was born into a restaurant family, and has worked in the business since he was 14. Nick has held every position from dishwasher, busboy, waiter and bartender to manager, general manager and now owner. He has taken numerous Health Department food handler courses and even has a Food Certificate License from Nassau County. Over the years, Nick has been an integral part of opening six restaurants. This experience has included the hiring and training of staff from top to bottom. He can also develop menus, job descriptions, cleaning schedules, equipment logs, and has authored employee manuals and procedures. Nick was a principal and General Manager of the Skipper Restaurant in Rockville Centre until it was sold in 1992. He has been a principal and General Manager of Frank’s Steaks of Jericho since 1993. Nick was the main force behind opening our Rockville Centre location, and is now the majority owner and president. Richard E. Gerzof was born in 1944 and graduated from Freeport High School and Hofstra University. He grew up in a hotel family with locations in the Catskill Mountains. Richard spent all of his early summers working in various capacities in his family’s hotel business. He has been associated with customer relationships in the food industry his whole life. In 1984, he started as a principal in the Skipper Restaurant until 1992 when he became a principal in Frank’s Steaks of Jericho. He joined our team to open Frank’s Steaks in Rockville Centre in 2002, and remains a principle there. Chris worked hard and was eventually promoted to management. Today, Chris is the Managing Partner of Frank’s Steaks of Rockville Centre, as well as one of three principal owners. You can really tell how dedicated Chris is to his craft. From how he treats staff to greeting every guest that walks through the door, there’s no limit to what Chris won’t do for his restaurant and customers.  When Frank’s Steaks was first established in 1988, Elliott Lovell was one of the original managers that helped develop the menu and overall concept. Today, Elliott is an owner and partner of the Rockville Centre location, as well as integral part of the Frank’s Steaks operation. As the General Manager of the Jericho restaurant, he travels between both locations to ensure a consistent product and good service for all customers. Elliott is very popular with the regular guests and is beloved by the staff of both locations. He grew up in lovely Bermuda and brings some of the island flavor and hospitality to both Frank’s Steaks locations. Elliott is a consummate professional and knows all aspects of the restaurant business, from the back of the house kitchen to the front of the house service.